USU Eastern men’s soccer team is sitting at 11-3-1 as they wrap up their season this weekend in Colorado against Otero Junior College who holds a 9-1 record . Eastern has won their last three games at home defeating Sheridan Community College 3-1, Northwest College 2-1 and Westminster 4-0. They barely squeaked by Weber in Ogden 1-0. Mourchid Youssef was a one-man show against Sheridan 4-8) on Oct. 1 as he scored the Eagles three goals; two were unassisted while the final goal was a pass by Andres Garza. 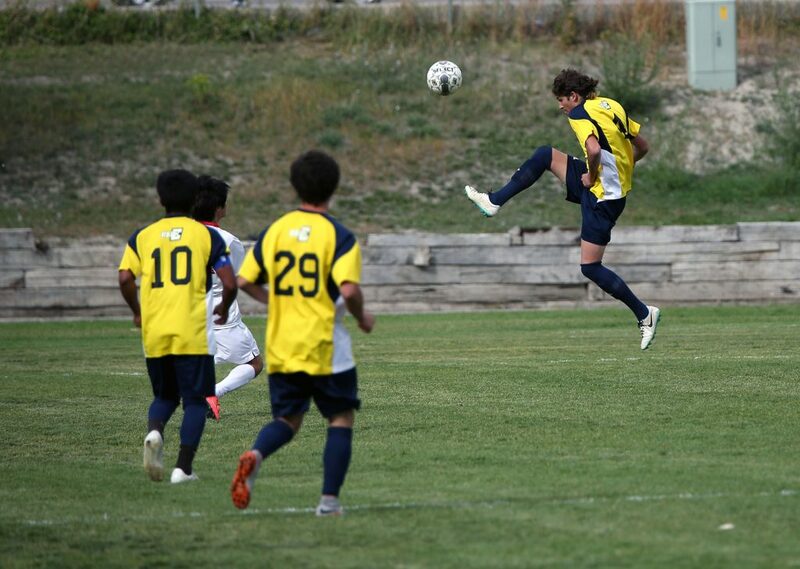 Sheridan’s only goal was scored by Vanja Hodovic from a pass by Carlos Rubio Garcia. Both teams received yellow cards with Sheridan’s coming in the first half, 1:43 into the game; Eastern’s came in the second half at 1:48. “We played okay, not well. We lost to Sheridan in Wyoming earlier in the season so we needed the win,” coach Ammon Bennett said. “I guess you could say we played well enough to win, but I would not call it a great game. Against Northwest, it was a windy, cold afternoon when the game began and the Eagles were up 2-0 at half. “The wind was to our advantage and we were up 2-0 quickly. “The second half, Northwest outplayed us. Again it was not a good game, but we were good enough to win,” Bennett said. A pass from Alexis Beiza helped Mourchid Youssef score the first goal and Beiza passed again to Jake Clements for the second goal in the first half. NW’s Charlie Gleisinger scored its only goal in the second half. The Eagles faced Westminster College on Sept. 26 and won 4-0 with goals scored by Youssef, Garza, Chase Virgil and Raul Cavasos. Youssef’s and Virgil’s goals were unassisted with Garza’s goal from a pass by Sam Kunckler, and Cavasos’ goal from a pass by Austin Kennedy. “The team played great. It was our second victory over Westminster and we controlled the entire game from the beginning,” Bennett said. All four goals were scored in the second half. The match against Weber State was horrible even though the Eagles won 1-0. “I’m not sure if it was the three-hour bus ride to Ogden, but the team had no energy, no pace,” Bennett said. With seconds remaining in the 90-minute game, Mike Brady was assisted by Luis Rico with a corner kick into the 18-yard zone. The men start their playoffs Oct. 24. They are the No. 1 seed and if they keep the ranking, the playoffs will be hosted at Eastern.